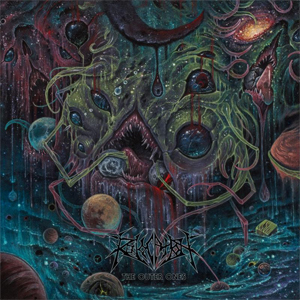 The Outer Ones sees REVOCATION pushing both the death metal and progressive elements of their signature sound harder than ever. "I knew that I wanted to go in a darker direction, and this is our most death metal album to date," states vocalist/guitarist Dave Davidson. "Sometimes when death metal bands go down the prog route they lose some of that edge, but we wanted to keep the aggression at the forefront of what we do while still pushing our boundaries." Moving away from the societal and historical themes that informed 2016's Great is Our Sin, this time Davidson has immersed himself in the fantastic, evoking one of the great writers of the sci-fi/horror genre. "The title is my ode to H.P. Lovecraft and the entities of pure cosmic horror that rule that universe he created. Since the new music we were writing was so evil and spacey in sections it seemed to be the right title to fit the overall vibe. But while the lyrical content is largely influenced by such writings, in every allegory there is of course some reflection of the real world, so I enjoy writing in a way that could have one overlaying meaning and then another deeper, symbolic meaning as well." This September/October, REVOCATION will head out on the road for their first North American headlining tour in several years, with EXHUMED, RIVERS OF NIHIL, and YAUTJA as support. See below for all dates!